In the second half of the 20th century, the phenomena of rock 'n' roll music, movies, and network television converged with the rise of tabloid magazines to shape a culture where celebrities had an outsize influence on both the American zeitgeist and American life. Celebrity photographer David McGough was there for most of it, waiting backstage or on the street, with his camera and an eager eye. His newly released book, Fame, is a coffee table sized collection of some of his greatest shots, interspersed with anecdotes of his life at the fringes of an era. A master of capturing the larger-than-life nature of both performers and (all kinds of) performance, as well as the tiny details that define character, McGough's work elevates the notion of "celebrity photography" into a genre of its own right. An intriguing, alternative narrative of the last half of the 20th century, the book shines a light on recent history, the anomaly of fame, and even current events, all seen through the lens of American popular culture. Inspired by his love of rock 'n' roll, McGough began his career photographing shows and musicians, eventually working for the New York Post. He later branched out to work with movie stars and even a few politicians. The 25-acre farm McGough shares with partner Lizzie Vann in the mountains near Woodstock is contemporary and comfortable, with plenty of room to share. 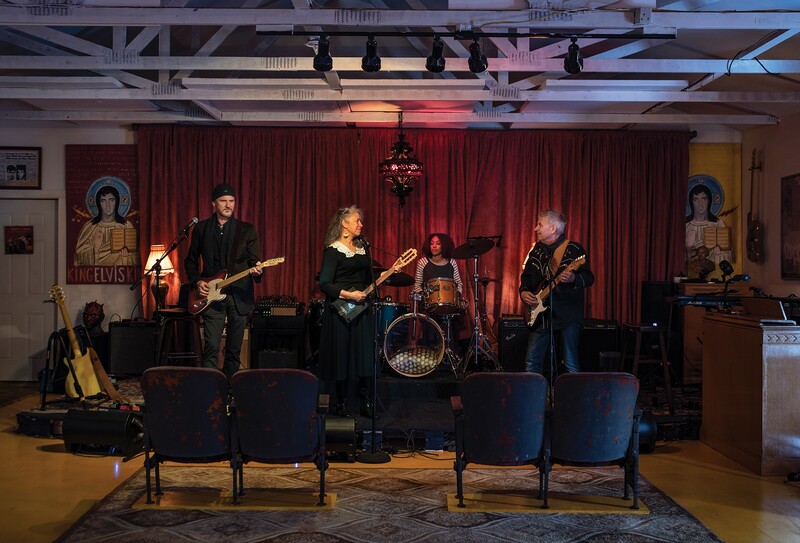 The former site of the Woodstock Farm Animal Sanctuary, McGough and Vann have transformed the home for rescued creatures into a place filled with memorabilia, art, and photography—with some space left over for rock 'n' roll. Based out of New York City for most of his career, McGough met partner Vann, the founder of the UK-based Organix children's food company, eight years ago in Florida. 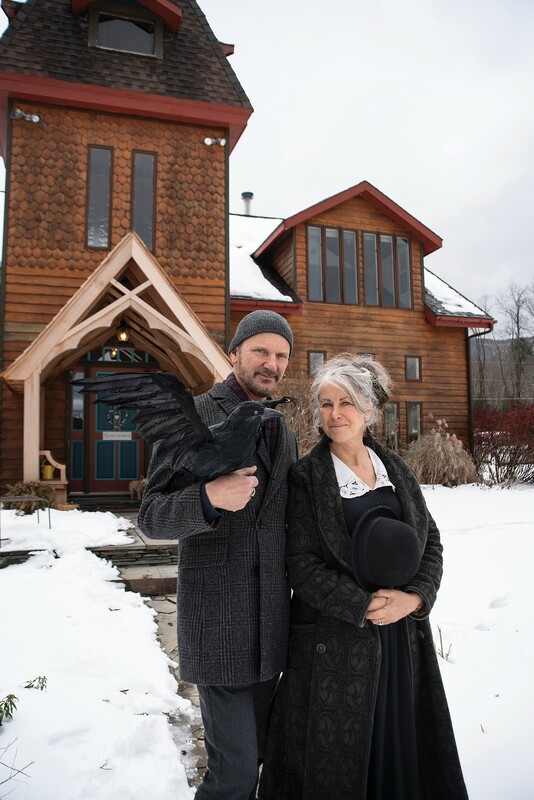 Wanting a space large enough to host friends and family, as well as their own musical performances, the couple moved to the Catskills three years ago and bought the former sanctuary space. While neither had ever visited the farm during its previous incarnation, McGough knew of it from his work volunteering with PETA. "I've been a vegetarian since my early twenties," he explains, "and I've owned horses and farm animals and have always been sympathetic to the plight of animals." He also felt a special connection to the property's history. 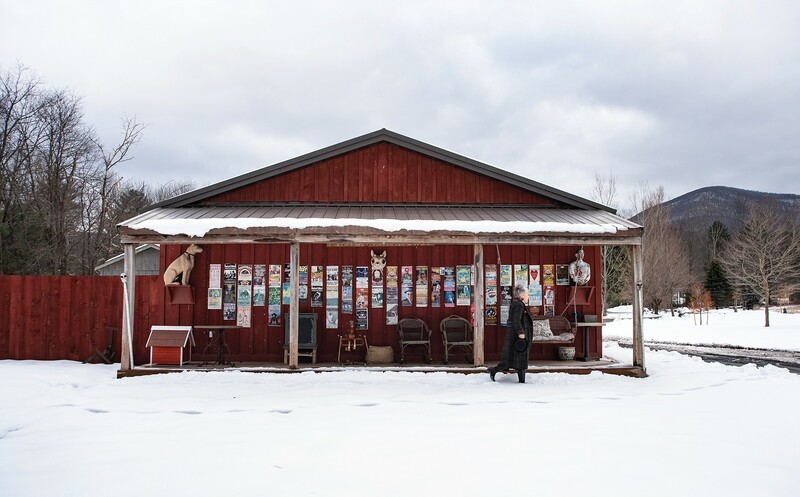 "Remember it was fame that kept this place going," McGough says, noting that multiple artists, such as Sean Lennon and Moby, performed on the main house's back deck, facing one of the open fields, to raise funds and awareness, and to support the farm's mission. However, like many of the creatures that found their way to its fields, barns, and sheds, when McGough and Vann bought the property it needed rehabilitation and a bit of tender, loving care. Right away, the couple began transforming the outbuildings, log cabin, and acreage into a personal haven. 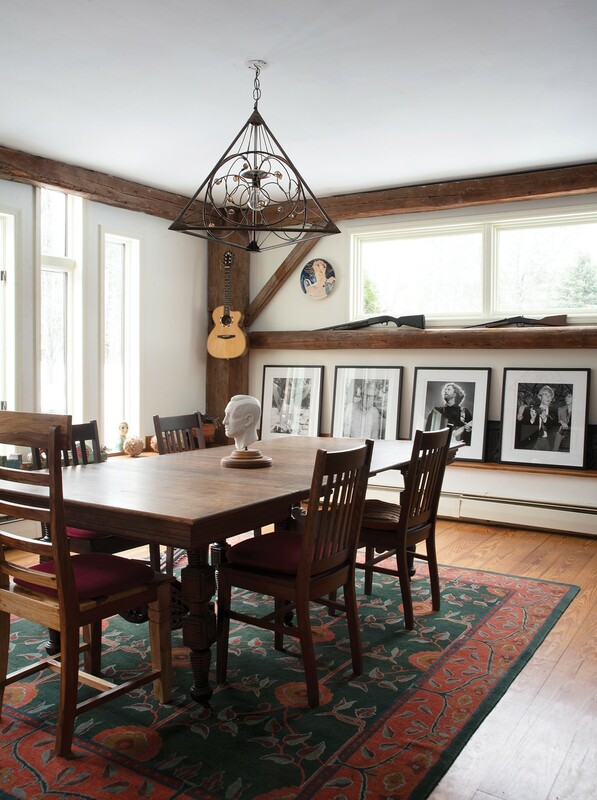 Comfortable and sprawling, the roomy property now has ample space for visiting family and friends, as well as a complete indoor stage—all of it decorated with the couple's eclectic, extensive collection of art, books and, of course, enough instruments to outfit the army of rockers who often stop by to jam. The main house, a two-story, 2,500-square-foot contemporary log cabin, was built in 1980 out of hemlock recycled from a previous structure on the property. 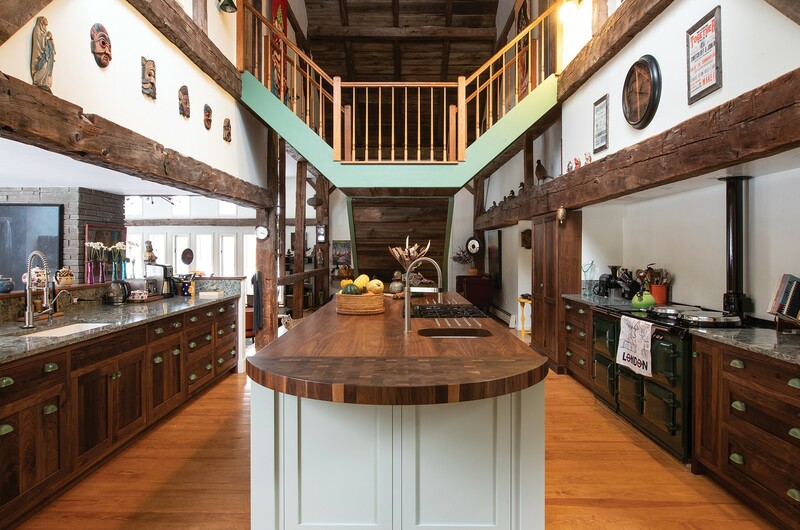 The open-plan first floor flows from kitchen to living room to step down dining area, all of it trimmed with exposed beams under two-story cathedral ceilings. 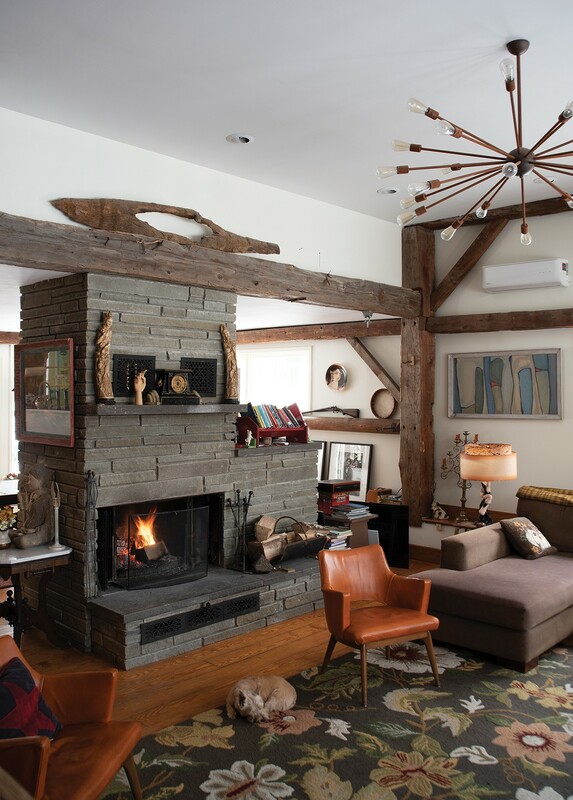 At the center of the space, a giant floor-through bluestone fireplace is open on either side to the living room and dining area. Both spaces feature some of McGough's iconic celebrity portraits as well as oil paintings and other artworks collected over the years. The couple undertook a complete renovation of the open plan kitchen, adding walnut cabinetry and expansive quartz countertops to the space. 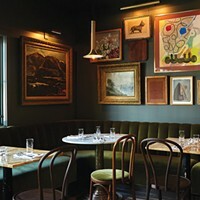 They added butcher-block counters to a central island and installed a large black cast iron "AGA" cooker to the space and then hung whimsical paintings of farm animals on the walls above. Across from the kitchen, a generous mudroom is enclosed by a set of stained glass doors original to the house. An office, full bathroom, and guest bedroom decorated with an Indian theme complete the downstairs. On the second floor, the couple walled off two loft spaces to create two large bedroom suites with vaulted ceilings. A split Imperial staircase leads to each private bedroom, both with bathrooms. The couple added extensive built-in shelving to each room, to house their large collection of biographies, and each space offers up views to the neighboring fields and mountains. Outside the various outbuildings required a comprehensive overhaul to become habitable. First, the couple removed the approximate mile of fencing that divided up the 25 acres into animal pens, and donated the fencing to some farmers in the area. They then went to work converting the four main outbuildings into useable spaces. The farm's 1,200-square-foot welcome center and veterinary clinic required a complete gut renovation. Damaged by mold and water, the couple tore out the center's interior and then rebuilt the space into a two-bedroom guest space with a full kitchen and bath, rechristening it "Castle Blayney," in honor of McGough's father, whose family came from the town of the same name in Southern Ireland. The farm's former tractor barn received the same top-to-bottom renovation. Now dubbed "Deacon Blue," the 2,000-square-foot space features three full bedrooms, a bathroom, and a complete kitchen. The Woodstock Farm Animal Sanctuary's former hog barn has been completely translated. The colorful warehouse with two-story ceilings is now an indoor performance and gallery space, with full stage and room for an audience of 80. The couple added recycled barn doors to the building's exterior, shoveled out all the mud, and then added floors. Mindful of the surrounding neighbors, Vann sound-proofed the space by adding two layers of Roxul Comfort Batt Stone Wool insulation to create 12"-inch thick walls and ceilings. "The great thing about having so many musicians in the area, is that there are also a lot of sound engineers —so we got some good advice," says Vann. 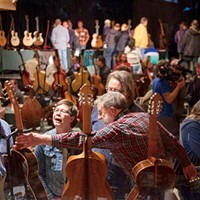 The space is decorated with McGough's extensive collection of guitars and other instruments and an adjacent room is now a gallery space displaying a collection of McGough and friend's art. Outside, the couple redid the main house's surrounding bluestone patio and added a fenced-in vegetable garden to the northern section of the property. In front of the house, the couple installed a circular bluestone sculpture around a horse chestnut tree, as well as a bench to sit and enjoy the landscape. Approximately 10 feet in diameter and three feet high, the sculpture is meant to reflect on the surrounding farmland and help guests feel at peace. They also added an outdoor pool for their guests to enjoy in the warmer months, and a fire pit for the cooler weather. Next summer, they plan to add a full pergola to the home's back patio. After years of "being invited to everything," says McGough, the couple are enjoying their new farm and the time and space to entertain guests. "Now, we are always the hosts," he says. Sat., April 20, 6 p.m.